Keep up with the all the Highland Row happenings right here. Stay tuned for news on the next HR Basement Market. Don’t miss it! We’ve got tons of one-of-a-kind items and some spectacular collectibles all priced for your Summer shopping. Ample free parking in the lot to the right of the store. Come early and get the goods! HRA HONORED TO BE SELECTED ATLANTA MAGAZINE BEST of ATLANTA! Highland Row Antiques is honored to have been selected by Atlanta Magazine as Best of Atlanta for 2018 for the Best Mid Century Finds in the Style & Design category. Owner Angela Carbon Baker and dealer Justin Wiles received the award on Tuesday, November 27th at the Atlanta Magazine’s Best of Atlanta celebration. Go see the article at https://www.atlantamagazine.com/bestofatlanta/2018-style-design/. 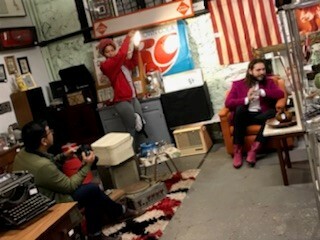 Rolling Stone Photo Shoot at Highland Row Antiques! CheapOair.com highlights Highland row antiques on travel blog! The travel site CheapOAir.Com highlighted Highland Row Antiques as a place to visit when traveling to Atlanta on their official travel blog. Go see the article at https://www.cheapoair.com/th ings-to-do/atlanta/antiquing-i n-atlanta/. highland row kickball team wins opener! The Highland Row Kickball Team won it's first game Thursday evening with a score of 5 to 1. Thanks for the great hustle and team work! Watch the HRA Calendar above for the dates and times of our upcoming games. Atlanta magazine visits highland row antiques! Atlanta Magazine recently visited Highland Row Antiques as we prepare for the May Basement Market. Read the entire article at, A treasure trove at Highland Row Antiques Basement Market and join us on Saturday morning at 10:00 a.m. for our monthly market! Office party? Knitting group? Book club? We’ve got plenty of space to accommodate large events and smaller areas for more intimate gatherings. Take a look at the photos below of the recent Atlanta Film Festival “Hangout at Highland Row.” Let’s chat about your next corporate shindig or club gathering. You’ll find more great info on Highland Row on Facebook, Instagram and Pinterest.